I had never been one for having spots, in fact I never ever used to get them until last year. I'm not sure what changed but around this time last year I started getting quite a lot of spots which I thought would just be a phase but it has been ongoing for the last year. As you can imagine I have bought everything under the sun to try and get rid of spots and keep them at bay and lucky for the most part my skin seems to be under control but still spot prone. So I thought I would review the products which I have tried. 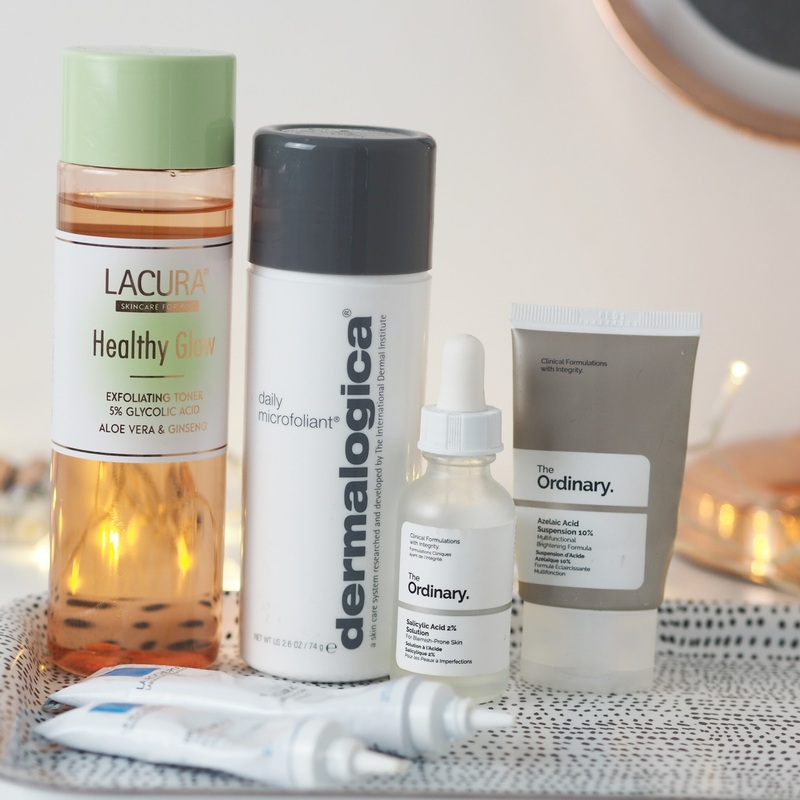 Lacura healthy glow- I recently reviewed this which you can read HERE it really made my skin feel so soft and smooth and also reduced the redness on my face left from spots which is something I really struggle with. I have been using this after micellar water as a second makeup remover! Dermalogica microfoliant - I have also wrote about this recently which you can read HERE but I just had to include this! This is amazing, it a gentle scrub for your face that isn't too harsh. It has really helped unclog my pores and reduce the little bumps which I seem to get on my forehead. I have incorporated this into my daily skincare routine and I cant rave about it enough! 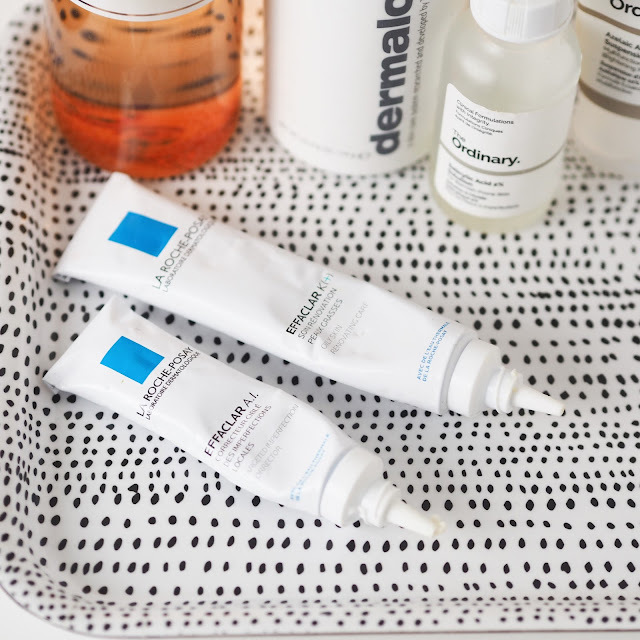 The ordinary salicylic acid - When I first tried this product I absolutely hated it, I used far too much without realising how strong it was. I decided a few weeks later to try it again but using a very small amount and it was much much better. I put this on my spots directly overnight and it really reduce the size of the spots and makes them so much calmer and less angry. I have just finished my bottle of this and will definitely be repurchasing. The Ordinary Azelaic Acid suspension- I have been using this for a few months now and have really noticed the difference, this has improved the texture of my skin massively its much less bumpy and rough and much more smooth. This also makes my skin feel so much calmer after using it overnight, its such a bargain for the price and I couldn't recommend this more. La Roche Possay effalcar duo- Now this purchase was definitely due to the hype surrounding it from other bloggers. I really had high hopes from this product after reading so many amazing reviews and I was so disappointed. This did absolutely nothing to my skin it didn't make it worse but it didn't seem to improve my skin either. Lush mask of magnaminty - Again read so many amazing reviews about this product and was really excited to try it. I put this on face for around an hour and honestly I notice such a difference, it makes my skin so soft and calm and really draws out the dirt from my skin and reduce the appearance of spots. It also smells so minty and fresh I really love this product. Of course everybody's skin is different and different products work for different people so this is just my personal experience with each of the products! Heard so much about the lacura healthy glow definitely want to try! My skin is awful at the moment and I hate the texture of it. I definitely want to try out Ordinary Azelaic Acid suspension!